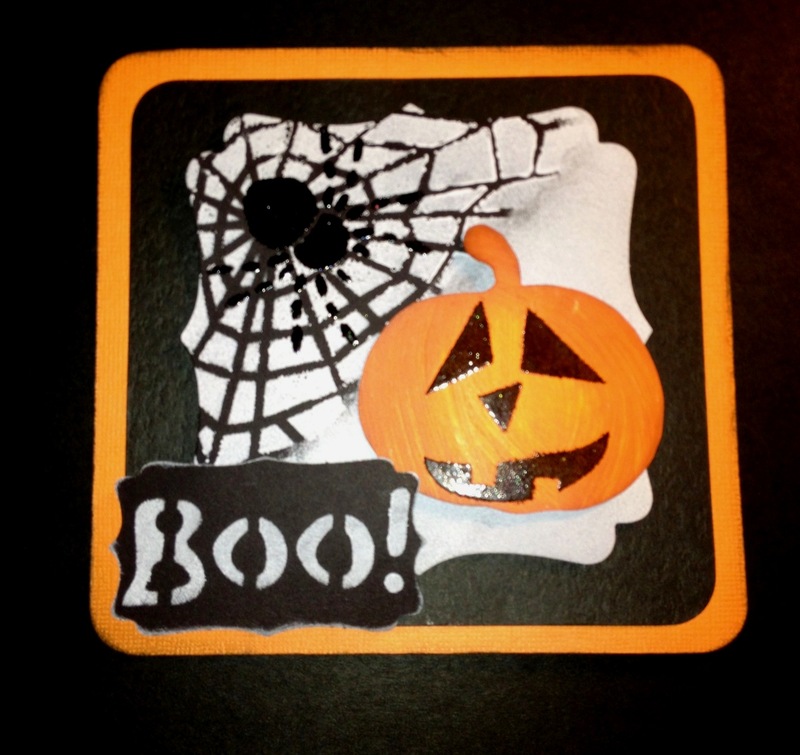 Kath here, just to share a quick and simple card I've made using the new Halloween Stencils I designed for Sue and Harvey. I'm really pleased with how they've turned out! And I can't wait to see your projects with them. 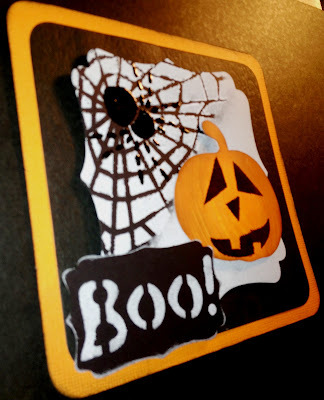 Tonight I would like to share with you a card that I made last month using Imagination Crafts products. 1. 8 x 8 Silver pearlescent square card which I have matted and layered yellow card, the purples card has been embossed using Diesire Embossalicious Regal swirl embossing folder. 2. The topper is designed by Lavinia stamps for Imagination Crafts which I have stenciled the Bird on a Branch from the Spring is Here Stencil using Amethyst Sparkle Medium. 2. I have added a row of pearl flowers which come in Strips, pearl gems and a spray of purple flowers and 2 silver leaves. 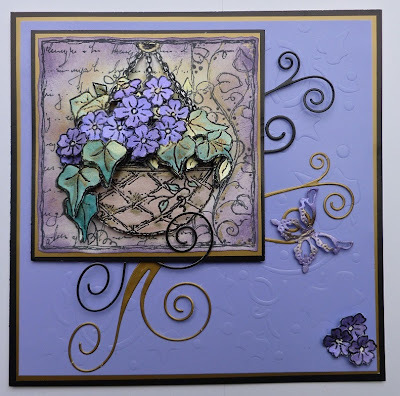 Today I would like to share with you a card I have made using the Hanging Basket Stamp from the Decoupage stamp Range from Imagination Crafts. Matt a piece of black card onto a 6"x6" base card, then matt a piece of gold card onto the black, leaving a small borderof black card showing. 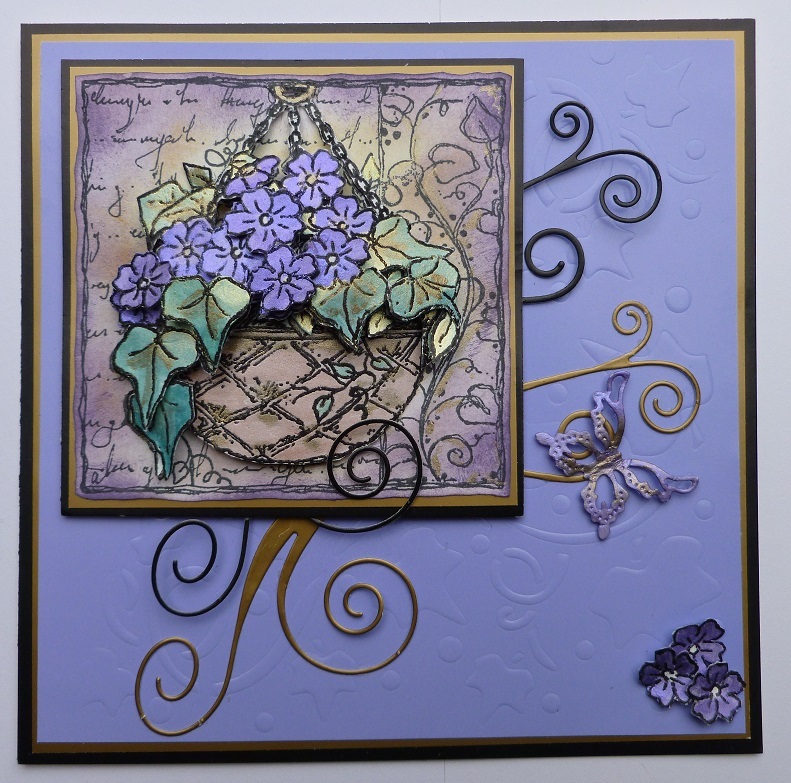 Take a piece of lilac card and using the ivy background stencil, emboss by putting through the Grand Calibur or similar machine. Matt this onto the gold card leaving a small border of gold showing. Cut out and emboss the two flourishes, one in black and one in gold. Glue these to the centre of the lavender card. Take some white card, colour with distress inks and using a black inkpad, stamp out the main image. Stamp out the image a further five times using a Versamark pad and heat emboss using black embossing powder. 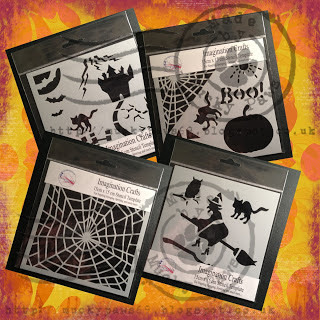 Paint the images with mica powders mixed with water and cut out, then 3d them onto the main image using silicone glue. Matt the whole image onto some gold then black shiny card, each time leaving a tiny border showing. Matt this on top of the flourishes using sticky foam pads. 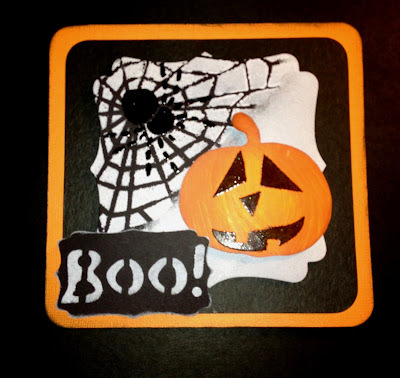 Cut out and colour three of the tiny flowers and glue to the bottom right of the base card. 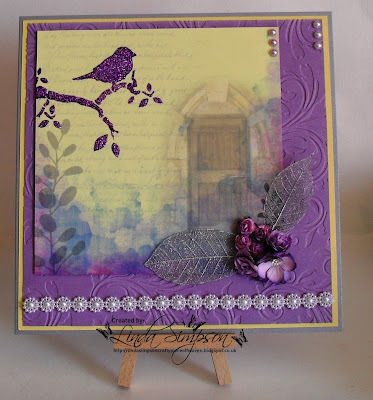 Cut out and emboss the butterfly and colour with the mica powders. Glue to the gold flourish. Well that's it, card finished. I'll be back soon with another card.